Superior CBD Products shop now for wholesale and retail strongest concentrated cbd in the market. We have the world's finest CBD products available. 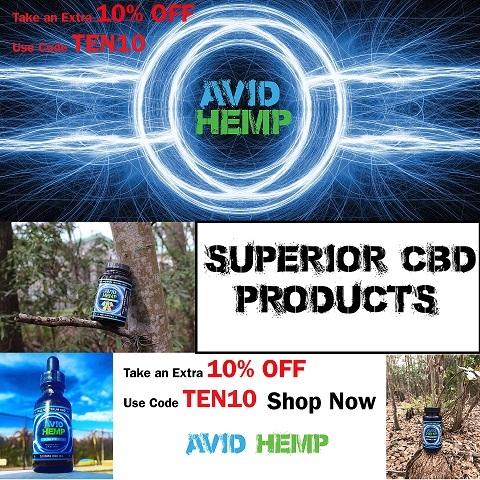 SUPERIOR CBD PRODUCT GUARANTEE Avid Hemp goes to great lengths to make sure the customer receives the best product possible. We have attached our CBD Lab Test at the top of the page under 'Our Company' tab. We ensure our customers are receiving the highest and best quality CBD possible. We guarantee our results with a 30-day money back guarantee. If you are ever unsatisfied with our products we will provide you a full refund. Our CBD is always 99%+ pure and our lab reports speak for themselves. However, we want you to decide yourselves; we only ask that you review us on our Avid Hemp Facebook page after you have tried Avid Hemp products and have seen the difference between Avid Hemp and other CBD companies. Research is beginning to show that CBD is different than other well-studied cannabinoids. All cannabinoids act as ligands, meaning they dock onto the binding site of a protein and have the ability to modulate a receptor�s behavior. CB1 receptors are widely distributed, but are particularly abundant in areas of the brain, including those concerned with movement, coordination, pain and sensory perception, emotion, memory, cognition, autonomic and endocrine functions. CB2 receptors are found mostly in the immune system, and they seem to reduce inflammation and certain kinds of pain. Although cannabinoids all have similar structures, they display a wide array of actions at each of the different receptors. However, scientists are finding out that CBD has very little effect on CB1 and CB2 receptors, which probably explains why it doesn�t have mind-altering effects, unlike THC, which positively regulates the CB1 receptor. That�s why most marijuana grown for recreational purposes are typically very low in CBD and high in THC.